Alleged civil rights leaders including Rev. Al Sharpton and NAACP President Benjamin Jealous are having a cow because Glenn Beck had the audacity to schedule his "Restoring Honor" rally August 28th on the steps of the Lincoln Memorial. It is the same date and location of Dr. Martin Luther King's famous "I Have a Dream" speech 47 years ago. These are the same hypocritical so-called black leaders who demanded that white America honor the memory of the civil rights icon with MLK boulevards across America. But, when a "white boy" chooses to embrace Dr. King's vision and dream by holding his "Restoring Honor" rally on the same day as Dr. King's historic speech, the Black Civil Rights Mafia, race profiteers, yell, "How dare you? MLK belongs to us!" I am a black American who wishes to thank brother Beck for honoring Dr. King in such a powerful way. Beck's "Restoring Honor" rally is linking the restoration of our great nation's Godly principles, freedom, liberty and culture to the black civil rights leader. Beck's rally is a wonderful tribute to the man I remember, when I was a little boy, as being larger than life. I was there, August 28,1963, in Washington DC with my dad — yellow school buses lined up and black people as far as I could see. I do not remember feeling hate in the air. Dr. King spoke of all Americans yielding to God, righteousness and brotherhood. Sounds like Beck to me. MLK was amazing: incredibly articulate, dignified, strong, powerful and bold. And yet, warm, calm and confident. To say I was in awe of him is an understatement. As a little black kid, I proudly viewed MLK as our Black Moses leading us, by God's grace and guidance, to God's Promised Land of Brotherhood and Freedom in America. Thus, you can understand my total revulsion with those who dis-honor and exploit MLK's legacy, while deceitfully claiming to preserve and celebrate what he stood for. National Urban League President Marc Morial said Beck's rally is "an effort to embarrass and poke a finger in the eye of the civil rights community because Glenn Beck and his public utterances don't necessarily demonstrate a consistency with the vision of King." Give me a break! MLK was a Republican. Glenn Beck's values and principles are far more consistent with MLK's values than the black civil rights leaders who have sold their souls to the anti-God, anti-family and anti-America progressives for political power. The modern day black civil rights movement has morphed into the Black Civil Rights Mafia, led by Godfather Rev. Al Sharpton. They make everything about skin color. Content of character is irrelevant to them — totally inconsistent with the vision of MLK. MLK's niece, Dr. Alveda King siding with Beck rather than the Black Civil Rights Mafia has them in a tizzy. "Dr. Martin Luther King, Jr.'s legacy, like the Lincoln Memorial itself, belongs to all Americans. I am participating in Glenn Beck's Restoring Honor Rally not to advance any political agenda, but to advance the concept of honor in our nation." Like Michael Corleone in the movie Godfather, I envision Godfather Rev. Al Sharpton furiously issuing a warning to Dr. Alveda King and all individual minded blacks, "Don't ever take sides with anyone against the Family again. Ever!" 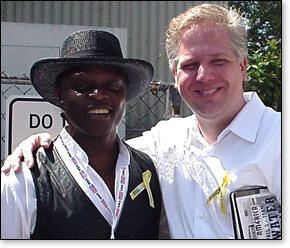 The Black Civil Rights Mafia's accusation that Glenn Beck is racially insensitive is unsubstantiated and absurd. It is a smoke screen to hide their real issue with Beck, Dr. Alveda King, black conservatives and the Tea Party Movement, which is ideology. As a long time Glenn Beck fan, I have never heard Glenn utter one racist comment. Beck regularly features blacks on his TV show. He aggressively strives to educate America to the tremendous contributions blacks have made in the founding of our great country. And yet, the Black Civil Rights Mafia has marked Glenn Beck as a racist. The Black Civil Rights Mafia uses their hit men and enforcers in the media to shut up opposing whites by bullying them with the race card. They attempt to shut up black runaway slaves from the liberal plantation by bullying them with the Uncle Tom card. The Black Civil Rights Mafia are the true racists, guilty of betraying their own people. While claiming their mission is "black empowerment," these race peddlers cripple blacks by convincing them they are victims. In reality, black Americans are truly blessed to be born in the greatest land of opportunity on the planet. Glenn Beck and MLK are also on the same page in their belief that in order for America to be restored we must turn back to God. The Black Civil Rights Mafia and President Obama take issue with America as we know it. Both seek to correct what they perceive as America's sins by implementing social justice/redistribution of wealth, which is a part of their socialist/progressive agenda. The multiple thousands of patriots planning to attend the Glenn Beck "Restoring Honor" rally are doing so because they love our country, freedom and liberty. Such thinking and feelings about our great country are an anathema to the Black Civil Rights Mafia and their media minions. Thus, their hatred for us patriots. It would be extremely foolish to pander to them. We patriots must defeat them.